HO/O-Scale Large Plowed Field measures 19" x 11". Freshly furrowed farmland mat with earth flocked textures. Easy to contour to terrain. 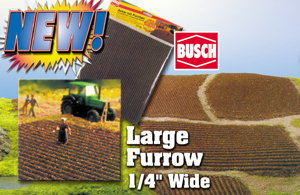 Furrow widths measure 1/4" deep.